CEO Ted Truscott and CIO Colin Moore sit down to discuss recent market events. Ted: 2017 was an extraordinary year in the financial markets. The S&P 500 Index didn’t have a single down month. But in February we saw some wild swings in the marketplace. Colin, what drove this market volatility? Colin: It’s important to distinguish between a good technical correction where excess enthusiasm in the marketplace is being let out, versus a real change in the underlying fundamentals — things like an underperforming economy or weaker corporate earnings. Fortunately, the recent market volatility falls into the former category, and the fundamentals are still strong. We’re seeing improvements in global economic activity, and we're seeing corporate earnings expectations rise — not just because of tax reform. So, when you get this type of technical correction, its scope tends to be limited. Ted: So we have solid fundamentals in the U.S., and we also see opportunities globally. But this recent round of market volatility took many people by surprise. Should they be concerned, and why do you think it was such a shock to them? Colin: If we think back to 2008, there’s been relatively few periods of upheaval like this. It has happened less and less. There are people who, for eight or nine years, have been investing in these relatively calm waters (supported by this tremendous central bank liquidity), and they now have to traverse more normal and volatile conditions. It’s almost shocking to them. I think this behavioral element is part of what's going on; investors are feeling surprised, but these are actually relatively normal conditions and not terribly troubling. Ted: Changes in interest rates, and in turn, bond yields, have played a big role. The Federal Reserve is also ending quantitative easing (QE), which is something we've never seen before. So, Colin, we have the pace of interest rate changes, QE and the whiff of inflation on the horizon all contributing to what's going on out there in the marketplace. What do you think? Colin: You’re totally right, Ted. But in my opinion, it’s the pace of the change as opposed to its absolute level. Ten-year bond yields at 2.8% or 2.9% are still not high historically. And we've had similar valuations in the equity market at higher bond yields before. But the recent pace of change has been fairly significant, and I think it caught people by surprise. It certainly created some of the turmoil that we've experienced. Ted: I was hoping you could dive a little bit deeper into quantitative easing or more specifically, the end of quantitative easing. I like to think of it as landing an Airbus A380 on an aircraft carrier, but maybe I'm exaggerating. Do you think central banks have a tall order ahead of them as they end QE? Colin: Whatever the right analogy is, Ted, no one's done it before because we haven't been in this situation before. So, it’s going to be tricky. I think it'll take a very long time to unwind, and all the central banks have been clear about that. Globally synchronized economic growth is happening and that’s a positive thing, but it means that we might end up with globally synchronized reductions in central bank stimulus. It's not just the Fed; the European Central Bank will begin to unwind QE (which we expect fairly imminently) and ultimately the Bank of Japan will follow suit. There's a little bit of an addiction that's built up around very, very easy monetary policy. We’ve been fed this “medicine” for several years now; it's difficult to walk away from it. Ted: You mentioned that rates haven't risen that much at an absolute level — they’ve been extraordinarily low. Since it’s more about the pace, what do you think is going to happen from here? Colin: Ultra-low rates are really telling people that there's some unusual risk in the marketplace. And while those conditions persist, people don't generally make big investment decisions, even if rates are really low. But when conditions begin to normalize, yes, rates go up, but people can see what the future is going to look like a little more — they're prepared to make longer term investment decisions. As we begin to unwind QE, and we normalize interest rates and 10-year bond yields, I don't expect it to set the market back too far because it never took full advantage of the ultra-low rates in the first place. Interest rates are an important part of the valuation on the equity market. It's growth divided by the risk to that growth, or interest rates. So as interest rates go up, it reduces the value. If you think back a year or so ago when Treasury yields were significantly lower than where they are today, then theoretically, the valuation of the market would have been 30, 40 or 50 times the price-earnings ratio, not the 20 or 22 times that we saw. This means the market never really accepted that those ultra-low interest rates were going to survive for a very long time. Ted: Colin, how about the emerging markets in the midst of all this? What do you think? Colin: One of the key beneficiaries of synchronized global growth among developed markets is emerging markets. Even on their own, there are some good reasons to be really excited about emerging markets at the moment. They're beginning to develop their own consumer activity, and they’re becoming more independent from developed markets. But we shouldn't forget that they still have a heavy dependence on developed markets for things like certain materials and semi-finished goods exports. So the synchronization of growth in developed markets is a real boon to their economies. Most of the valuations in the markets outside the United States are a little cheaper. There's an exciting opportunity for growth to follow the development of the economies as they mature, especially because they get a kicker from developed economies’ growth. Ted: So, obviously, the question on everybody's minds is: What do investors do from here? What would you tell advisors and their clients during this period? Colin: It's the destination, not the journey. If you have a goal you've worked out with your advisor, and you have a good asset allocation to reach it, it's a question of sticking with your plan rather than become overly concerned about bouts of volatility. 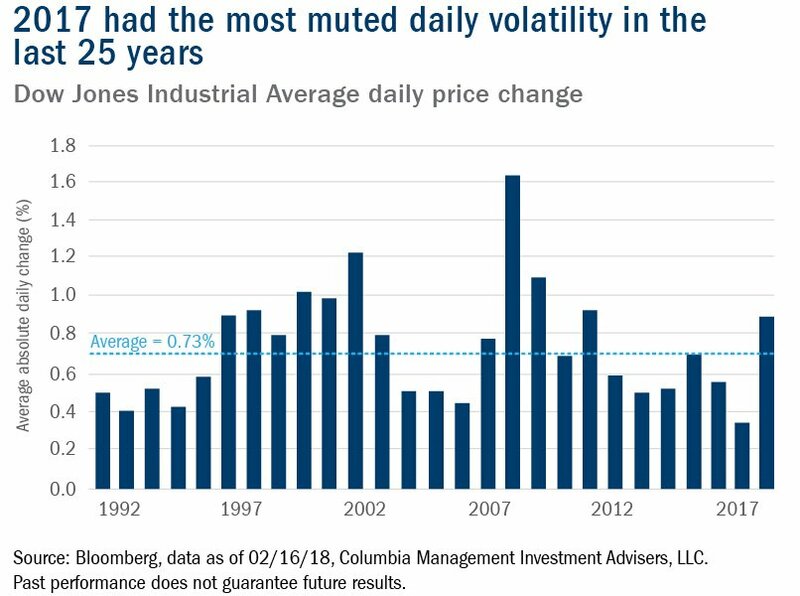 Bouts of volatility are normal. If you use a boating analogy, it’s hard to cross the ocean without hitting an occasional rough patch of sea. You need to focus on the destination. It's worth getting there. But it’s also important to ask the question: Is this type of turmoil caused by some technical change or by a decline in the fundamentals? To me, because the answer has been very much a technical change, you can be even more comfortable about focusing on the end goal and not worry about short-term volatility.